Harry Gabriel Hamlet was born on 27August 1874 in Eastport, ME. He was the son of Captain Oscar C. Hamlet of the US Revenue Cutter Service. He graduated from Dorchester (MA) High School and attended Massachusetts Institute of Technology. He was appointed a cadet from Massachusetts on 12 April 1894. He received his early Service training and instruction on the practice ship Chase. He graduated high in his class and was commissioned an ensign on 27 April 1896. His first assignment was on board the historic cutter Bear. He was attached to that vessel on her Relief Expedition to the Arctic in 1897-98. This expedition successfully rescued the crews of four whaling vessels and the event has gone down in history as one of the most arduous and perilous rescue expeditions to the Far North. In 1900 he went to Newport, RI as one of the first Revenue Cutter officers to attend the US Naval War College. In 1901 he returned to the Coast Guard and was assigned to the Coast Guard Cutter Bear. From then until the entrance of the United States into World War I, he served with credit aboard units of the service on both the East and West Coasts, as well as in Alaskan and Arctic waters. When the United States entered the war, he was assigned to the Third Naval District and organized the various activities and the training of personnel at Naval Section Bases Six and Nine. He subsequently joined the United States Naval Forces at Brest, France assuming command of the USS Marietta in October 1918. On 23 April 1919, while in command of this vessel, he rescued the crew (two officers and 45 men) of USS James which was sinking in a heavy gale off the coast of France. With high seas threatening to crash the two vessels together, he skillfully and courageously maneuvered his ship alongside James and was instrumental in saving all on board. In recognition of his gallant conduct, the Secretary of the Treasury awarded him the Congressional Gold Lifesaving Medal and he received a Special Commendation from the Secretary of the Navy entitling him to wear the Silver Star upon his service ribbon. In September 1919 he reported to Coast Guard Headquarters in Washington, DC and was assigned as Personnel Officer. He was also placed in charge of ship operations and served in this capacity until his detachment in May 1922. He then assumed command of USCGC Mojave at Honolulu and took that vessel on her cruise to the Far East. When Congress made provision for the acquisition of additional vessels for the Coast Guard in 1924, he was ordered to the Philadelphia Navy Yard. Appointed superintendent for the reconditioning, outfitting, and commissioning of the 20 former-Navy destroyers turned over to the Coast Guard, he managed the expenditure of over $2,400,000 in repair funds and trained the crews for these vessels. The Commandant commended him for his exceptionally meritorious and efficient service in discharging these duties. In July 1925, after the commissioning of the reconditioned destroyers, Hamlet became the commander of the newly organized Coast Guard Destroyer Force. In October 1926 he was promoted to the rank of Captain and in May 1928 he was appointed Superintendent of the Coast Guard Academy at New London, CT. After exemplary service, President Herbert Hoover appointed him to the office of Commandant of the United States Coast Guard on 14 June 1932. Hamlet’s foremost problem during his as Commandant concerned Coast Guard appropriations. With the Great Depression affecting the entire nation, Coast Guard budgets were understandably small. In 1933 the service implemented a cost cutting plan that resulted in the decommissioning of vessels, closing of stations, and the reduction of manpower. In total Hamlet cut Coast Guard expenditure by 25 percent. This, unfortunately, led to reconsideration of making the Coast Guard a part of the Navy. Through his efforts, Hamlet was able to forestall this reorganization by President Franklin Roosevelt. He pointed out that the mission of the Coast Guard was distinct from that of the Navy. If the services were combined, the Coast Guard’s traditional missions would be overwhelmed by the need to meet traditional naval missions. Such a result was counter to national goals. Chief of Naval Operations, Admiral William V. Pratt concurred with Hamlet in his opposition to the plan. Despite this opposition, the Coast Guard’s transfer to the Navy seemed imminent. Congressional opposition, however, prevented the transfer and the service maintained its separate identity within the Treasury Department. For a term of four years he held the rank of Rear Admiral, Upper Half. Upon completion of his term in 1936, he reverted to the rank of Captain and was detailed to special duty in the Secretary of the Treasury’s Office. During this time he performed additional duty as Chairman, Personnel Advisory Committee, Committee on Commerce, United States Senate. This position involved the study of maritime problems and recommended legislation to improve the American Merchant Marine. 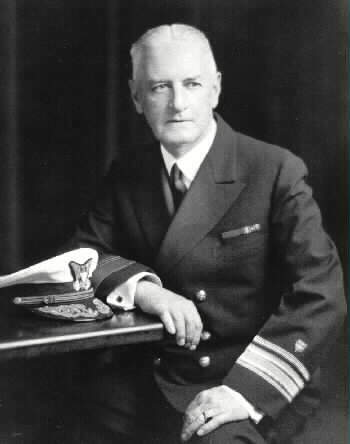 Vice Admiral Hamlet retired on 1 September 1938 after reaching the retirement age of 64. Because he had served as Commandant, his retired rank would have been Rear Admiral, Upper Half, but this was raised one grade to Vice Admiral by virtue of his having served more than 40 years in the US Coast Guard. 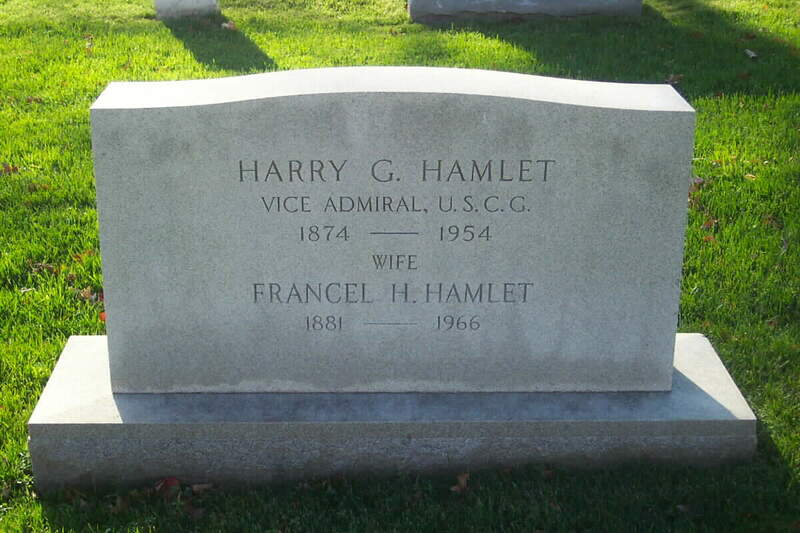 Vice Admiral Hamlet died on 24 January 1954. Born at Eastport, Maine, August 27, 1874, he was a student at the Massachusetts Institute of Technology, 1892-93, and graduated from the United States Coast Guard Academy in 1896. He married Frances Allen Hastings, April 26, 1905. He was commissioned an Ensign, USCG, April 27, 1896 and advanced through the graded to Vice Admiral and Commandant, June 15, 1932. During his career he was awarded a Gold Life Saving Medal, the Silver Star (USN), the Victory Medal (WWI), the Commander of the Crown of Italy. He was a member of the Military Order of the World War, the American Legion, Veterans of Foreign Wars, Military Order of the Caribou, Sigma Alpha Epsilon, Pi Gamma Mu. He was an Episcopalian and a 32-degree Mason. He was a second-generation Coast Guard officer, his father being a Captain in the Revenue Cutter Service (the forerunner of the Coast Guard). After being commissioned in 1896 he was sent the next year aboard the Cutter Bear on a rescue mission to the Arctic. In October 1918, he was in command of the USS Marietta and in 1919 rescued the entire crew of the USS James which was sinking off the coast of France. He was appointed Commandant in 1932 and, by the end of his 38-year career, had served in virtually every type of Coast Guard assignment. He died on January 24, 1954 and was buried in Section 4 of Arlington National Cemetery.